My 10 month old son seems to enjoy playing in enclosed spaces. When we go to children’s play areas around the city, he often spends a fair amount of time inside toy houses, and tubes that he can climb through. Lately, after nursing him in the morning, my husband and I have been raising the blanket up over his head and he loves climbing through the bed underneath it. My latest and greatest discovery in the world of baby products is a small red tent from Ikea. My son absolutely loves it. He enjoys playing peekaboo and hiding in there. He likes peeking out and finding us through the little windows, and he gets super excited if my husband or I follow him into the tent, at which point he begins to laugh and yell and spin around in place. It is quite amusing to watch him. 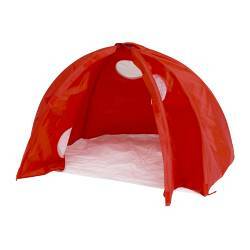 The tent very simply snaps together and has mesh windows, which adds an extra element of play. It folds flat for storage and is easy to clean. Overall: a great product at a great price.